mailings he/she has to return the original letter…I guess so there is no “small print” left in a person’s hand. I PDF filed all of it so I had proof of what was written. My 91 year old Grandmother recently went into hospital. After going through her bills it looks like Reader’s Digest has taken her for tens of thousands of dollars. In an 18 month period she paid RD just under 6 grand, and she has been signed up with them for over 13 years. Readers Digest uses the tiniest font possible in their fine print. There must be a way that a law can be passed that will require the use of a minimum size 14 font. Then maybe our seniors would stand a fighting chance. 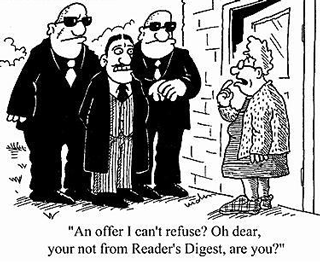 I am considering attempting to get a No Contact order on behalf of my Grandmother against Readers Digest. The folks at RD are quite simply low lives with virtually no moral backbone – if they could dig the gold out of grandma’s fillings they would not hesitate. Why do we tolerate it? Because RD, on some perverse level… is considered sacred in Canada. They are pure evil and more folks need to know how they abuse our seniors. I have just discovered that my 90-year-old mother has been (and continues to be) a RD victim for at least a year. Here in the US we’ve managed to force RD to print their “no purchase necessary” in large font. Why is Canada unable to do this? Keep posting your rant! We families of victims need a current website to turn to – everything I find is old. We have the same problem in Australia lost count of times material was returned to RD that we never sent for read fine print with magnifying glass and any e-mail use zoom to read. These people are a curse.